Help Us Light The Halls With Pink This October! 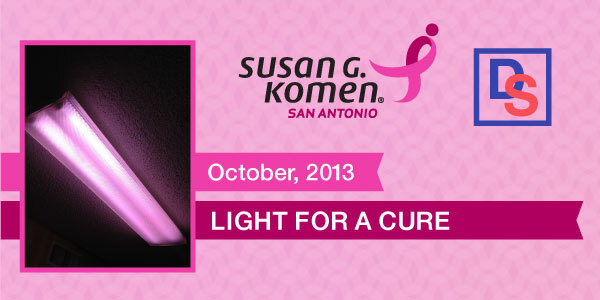 Home » Help Us Light The Halls With Pink This October! “1 in 8 women will be diagnosed will breast cancer in her lifetime” – www.komensanantonio.org Since early detection is the best defense against breast cancer today, we have teamed up with Susan G. Komen San Antonio to help raise awareness in our own way. If you have fluorescent lighting in your hallways, and offices at work we have a special project for you. It may be time for you to change some of those flickering fluorescent bulbs out, if so this is the perfect project for you! This October we are providing pink tube guards to help show our support by lighting up with pink. They are easy to install, and will light your space with a soft pink. This is a great way to show your support and help raise awareness in high traffic areas, and don’t worry it wont turn the entire room hot pink! Slide the breast cancer pink tube guard over your fluorescent tube, secure the end caps and install your new pink light. Another great thing about have tube guard covers on your lights is that you’re protected. Fluorescent bulbs emit UV radiation that can have negative affects on your productivity if your exposed for long periods of time. Studies have shown that the best light conditions for work are those that provide full spectrum light (or the equivalent of sunlight). Tube guards help filter 99% of UV radiation from fluorescent tubes. Tube guards also protect you in case the bulb breaks. Tiny shards of glass will be contained in the tube, as well as mercury vapors that can be released into the air. Check us out on Pinterest for more creative lighting solutions! Find The Lighting Solution You Need, Online!